WITH 169 PAGE PDF AND 90 FREE SONGS, ON SALE NOW! 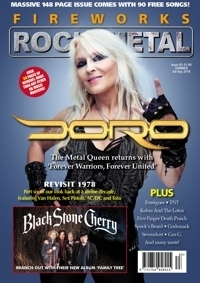 INTERVIEWS WITH: Doro, Black Stone Cherry, Foreigner, TNT, Sevendust, Dare, Gioeli/Castronovo, Five Finger Death Punch, American Tears, Godsmack, Gus G, Ryan Roxie, Spock's Beard, Amorphis, Shinedown, Kobra And The Lotus, Night Flight Orchestra, Praying Mantis, Vega, Stormzone, Lords of Black, Robby Valentine and MANY MANY more! The Divine Decade is a 4 page look back to 1978, with stunning debuts from Van Halen, Whitesnake, Toto and Zon along with defining live classic from Thin Lizzy, AC/DC, BOC, Ted Nugent and Scorpions. Plus so much more! PLUS OVER 50 PAGES OF DETAILED REVIEWS! Interviews, features, reviews and 90 FREE songs: LET'S ROCK!